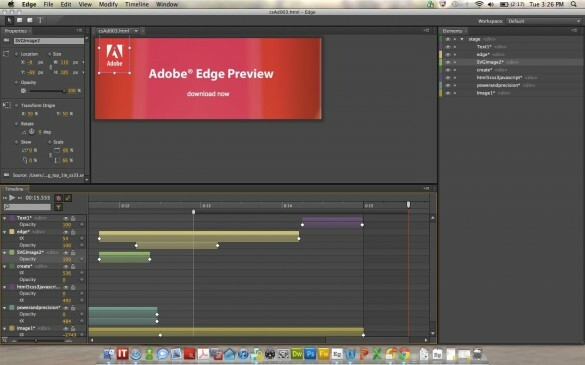 Adobe, the company that owns Flash, has decided to enter the HTML5 field and has introduced its preview release of their new editor codenamed Edge. Realizing its once almost universal plugin, Shockwave Flash, was beginning to diminish in consumer products, such as mobile platforms not being able to handle the product, or in a case of Apple where Flash has been banned from being run on iOS. HTML5 can be handled on all platforms, it just made sense for Adobe to enter this field. If a user is familiar with Adobe Flash CS5, the program works about the same. Because it is still in its testing phase, many features from Flash CS5 are not included in this current build, but over time will be. Currently, users can only create animations, but as time goes on, Adobe plans to introduce more shapes that are not just rectangles, expressivity, coding, interactivity with actions triggered by events, and graphics. Adobe also plans to include audio and video integration, along with the already included SVG, PNG, GIF, and JPEG images. This software can be integrated with Dreamweaver, Adobe’s web design software, or any other web tools software, which is supposed to be a seamless integration. If you are interested in this new software, you can download the public release for free, using your Adobe ID, on the Adobe Labs webpage. It will run for about 150 days, and when the trial has ended, you will have to buy the software, which is planned to be sold in its finished state in 2012. This is a dummy guest post account for writers who have submitted stories to the blog. I am an account that takes care of all the guest activity around the blog.